Ivy leaf violet. Image by Ian Moodie. A fast growing perennial herb with light green kidney-shaped leaves up to 30mm long. Ivy-leaf violet forms roots at the leaf nodes and underground stems form a deep mat. The flowers are held erect above the leaves. It has small white flowers with purple centres held above the leaves on stalks up to 100mm long. It flowers most of the year, especially June to March. The fruits of the Ivy-leaf violet are capsules 8mm-12mm in length. They release the seeds from valves. The seeds change colour when they ripen, changing from cream to dark maroon/pale brown. It tolerates full sun or part shade. Ivy-leaf violet grows abundantly once established. It is an excellent ground cover and an attractive hanging-basket plant, preferring a well-drained soil. It can also be used as an alternative to lawn in low-traffic areas. 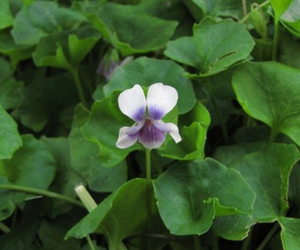 In Boroondara, Ivy-leaf violet can be found along our creeks and waterways. Ivy-leaf violet provides food for butterflies as well as shelter for small skinks and possibly small frogs. Shiny everlasting daisy. Image by Ian Moodie. An erect, biennial herb, one of the more popular paper daisies. It grows to 50cm x 50cm and has narrow, lance-shaped leaves usually 1.5cm to 10cm long. It dies off in summer and re-shoots in autumn. 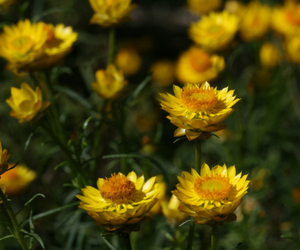 It has bright yellow flower heads and mostly flowers in spring. The seeds are borne through the air on fluffy pappus-like dandelion. Sticky everlasting grows in full sun. Sticky everlasting prefers a well-drained soil. It is perfect for rockeries and cottage gardens, especially when planted in masses or drifts. To encourage longevity and bushiness, prune hard after flowering. In Boroondara, Sticky everlasting can be seen in Friends Group plantings in Willsmere Park. It is attractive to birds, bees and butterflies.